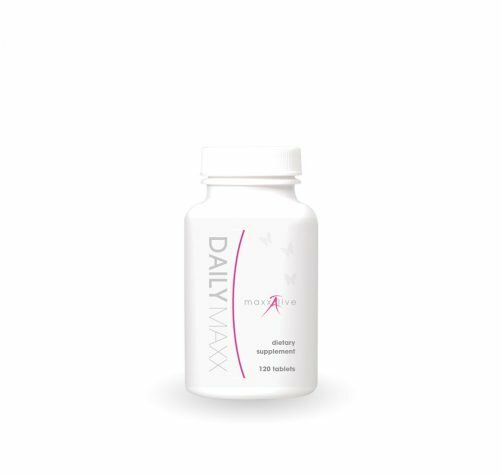 DailyMaxx is a complete blend of vitamins, minerals, antioxidants, fruit and vegetable extracts from 23 fruits and vegetables, and specially selected nutrients to support hormone balance and overall women’s health. DailyMaxx is a great source of indole-3-carbinol(I3C) and DIM (diindolylmethane), which are tremendous nutrients to mitigate estrogen dominance and support a healthy immune system. Finally, DailyMaxx uses a plant-derived calcium source with a patented form of Vit K3 to improve your body’s ability to absorb and utilize calcium. “Daily Maxx is one of my standard products that I turn to in any case of increased Estrogen, Estrogen dominance, unhealthy Estrogen metabolism, inadequate Progesterone and general hormonal imbalance. Over regular, consistent and patient use, it all but guarantees improved hormonal health and balance. A great formula – one of the best for these issues!” David Sloan, PhD, NNCP, RNT, Clinic Director – Sloan Natural Health Center.